introduction For much of the year, any walk through the woods reveals an assortment of fascinating mushrooms, each playing an important role in the forest ecosystem. This guide serves as a reference for some of the mushrooms* you may encounter while hiking in the Metro Parks. It is arranged in four sections: mushrooms with gills, mushrooms with pores, morels and others. Each mushroom is identified by its common and scientific name, a brief description, where and when it grows and some fun facts. As you venture into the woods this spring, take a closer look at the mushrooms around you. 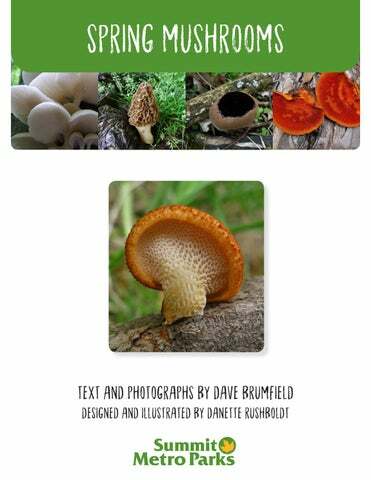 Our hope is that this guide will help you to identify them, develop a better understanding of the role they play in nature and inspire you to further explore the world of mushrooms. Remember, mushrooms can be very tricky to identify − it’s best to avoid eating any found in the wild, as many varieties are dangerous or even deadly to consume. Happy Mushrooming! Naturalist Dave Brumfield * Due to recent DNA studies and current taxonomic uncertainty, some scientific names may have changed. Cap ........................ Supports and protects the gills; color and shape depend on stage of growth and species. Gills ...................... T  he lower surface of the cap, composed of blade-like layers stacked side by side. Spores are produced and released by the gills; other mushrooms have pores, teeth-like structures or some other means of spore dispersal. Mycelium ............... The mass of thread-like hyphae found in soil and other substrates; it absorbs nutrients from the substrate. When conditions are right, mushrooms develop as the fruiting body of the mycelium. Ring ....................... As a mushroom matures, a partial skin covers the edge of the cap to the stem. The ring is what is left when the mushroom cap grows and stretches the skin to breaking. stem ...................... The structure that holds the cap above ground; not all mushrooms have a stem. Universal veil ......... A tissue surrounding the developing mushroom button (it is like the shell covering an egg). Volva ...................... If the mushroom has a universal veil, what is left at the bottom of the stem when the veil is broken is the volva; common in Amanita species. DEER MUSHROOM (Pluteus cervinus) The buck stops here! Antler-like structures called cystidia project from the gills, giving this mushroom its common name. Fun facts • The gills of this mushroom have a radish-like smell. • This is one of the first mushrooms to appear in spring. MICA CAP (Coprinellus micaceus) i’m melting! mica caps belong to a group of mushrooms known as inky caps because as they mature the gills dissolve into a black inky-like liquid. OYSTER (Pleurotus pulmonarius) A similar looking mushroom is Pleurotus ostreatus, but it usually fruits in the fall and winter and the caps are more brownish in color. PLATTERFUL (Megacollybia rodmani) This mushroom is often confused with the deer mushroom (Pluteus cervinus). If you check mature gills, P. cervinus has pinkish gills that are free from the stem. WRINKLED CAP (Psathyrella delineata) Psathyrella delineata has a tendency to change colors as it dries out, sometimes resulting in two-toned specimens. Delineata means “with visible lines “ referring to the wrinkled lines on the cap. BIRCH POLYPORE (Piptoporus betulinus) mushrooms in history Otzi, whose frozen mummified body was found in 99 in the Oetztal Alps, had some birch polypore among his possessions, possibly for treating intestinal parasites. Fun facts • P iptoporus betulinus has the nickname “razor strap fungus” because the tough leathery strips of the fruiting body were excellent for sharpening blades. How to Identify it •C  ap is a red-orange color, semicircular and flat; upper surface is dull orange, smooth to bumpy,  to 5 inches wide; the fertile surface (underside) is a bright red-orange color. The fruiting body can be solitary or grouped, sometimes overlapping. who needs flowers when you have me? April showers often bring more than just May flowers. While enjoying woodland wildflowers be sure to look for this beautiful little polypore. Fun facts •D  epending on the field guide you are using, it is also known as Polyporus alveolaris and Favolus alveolaris. Polyporus tulipiferae because of its association with one of its hosts, the Tulip tree. • F ruiting body grows flat against the branch, is whitish with pore surface extending outward. The pores eventually break up into irregular shaped tooth-like projections, except on the edge. As the mushroom ages, the pores turn a yellowish color. easy to see how this mushroom got its common name. BLACK MOREL (Morchella angusticeps) i’m a winner! Morels are among the most highly prized edible fungi. The main feature differentiating M. angusticeps from other morels is the fact that its ridges are darker than its pits. poisonous At first glance this mushroom looks like one of the edible morels (black/yellow). Unfortunately, this mushroom can be quite poisonous. So use your brain and leave this one alone! 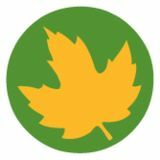 How to Identify it •C  aps are wrinkled and brain-like, reddish-brown in color,  to 5 inches wide • S tem and cap are 2 to 5 inches high; usually filled with cotton-like fibers, whereas true morels are hollow when cut top to bottom. HALF-FREE MOREL (Morchella punctipes) As its name suggests, the top half of the cap is attached to the stem, the bottom half hangs free like a skirt. In yellow and black morels, the lower edge of the cap is attached to the stalk. Fun facts •T  his mushroom used to be called Morchella semilibera but recent DNA studies have shown M. semilibera to be a European species. YELLOW MOREL (Morchella esculentoides) In 1984, Minnesota declared the yellow morel its state mushroom. shouldn’t ohio have one Too? A true morel will be hollow inside from the tip of the cap to the bottom of the stem. Fun facts •M  orels are a delicacy around the world and many people will pay a high price to have them. K. deusta is parasitic on the roots and lower trunks of living hardwod trees, especially beech and oaks. How to Identify it • F ruiting bodies form sheets of irregular shapes that cling to the substrate. New fruiting bodies formed in the spring are whitish-gray and, as they mature, they become bumpy and black. This crust fungus can cover large portions of a log and resembles tiny pieces of ceramic tile. Fun facts • Ceramic parchment is a type of crust fungus. • Found on decorticated logs (logs that have lost their bark), especially oaks, and helps add nutrients to the soil. The Crown-tipped coral is one of the few coral mushrooms that fruits on wood. Fun facts •C  rown-tipped coral plays an important role in breaking down tough, woody materials and returning nutrients to the soil. DEAD MAN’S FINGERS (Xylaria polymorpha) Polymorpha means having many forms. This is certainly true of this unusual looking mushroom! How to Identify it • F ruiting bodies are club-like in shape (sometimes knobby looking) ½ to 3 inches high. In spring they are usually white to blue-gray in color, covered by powdery spores (asexual stage). At maturity they become black, covered in tiny bumps (sexual stage). Fun facts • Break open the fruiting body at any stage and the flesh is always white. How to Identify it •C  ap is urn-shaped and  to 3 inches wide. The inner surface is fertile, smooth and dark brown to black, the outer surface is brown, darkening as it ages. Fun facts •T  his is one of the first mushrooms to fruit in the spring. The presence of this mushroom often signals it is time to start looking for black morels. Some even refer to it as the harbinger of morels. SCARLET CUP FUNGUS who’s who? The photo on the left shows a complex of scarlet cups. Two species (Sarcoscypha austriaca and Sarcoscypha dudleyi) grow east of the Rocky Mountains. To positively identify them you must examine them under a microscope. Fun facts • This common mushroom is one of the first signs of spring in Eastern hardwood forests. You aren’t too tough for me! Fun facts • S arcoscypha occidentalis is an important decomposer in forest ecosystems, helping to break down complex molecules like lignin and cellulose. SLIME MOLDS Slime molds are neither plant, animal nor fungus. At times they act like a single-celled amoeba, moving and feeding on bacteria and organic particles on rotting logs and leaves. As these cells fuse together, they form a mass known as plasmodium. The plasmodium moves about feeding like a giant amoeba. When food becomes scarce or environmental conditions become unfavorable, the plasmodium will begin to form fruiting bodies. These fruiting bodies come in a variety of sizes, shapes and colors and serve to produce and release spores. Because they resemble a fungus in this stage of their life cycle, they were once classified as fungi. The following are examples of slime molds you might encounter at some time throughout the year. When reddish in color, this slime mold resembles red raspberries. Easy to see how this mold got its common name ... just don’t eat it.